I've built a small pool in my backyard, about 8 ft diameter with a water depth approximately 1 to 1 1/2 ft. It's lined with PE film and the bottom is covered with sand, pea gravel and some river rock. In the center is a fountain (pee boy) that runs continuously. The water is from the city source and after I filled it I let it recirculate for about four days until it was completely clear and then tossed in a few goldfish to see how they would do. Lost one the first day (I don't think it had anything to do with the water) and one after four days. The others appear pretty healthy. There is a small brick construction to offer a hiding/shade place in the back. I need to replace the liner and plan on doing that in a couple of weeks but first I wanted to get some advice on how best to re-set it up. 1. Will I need to add a filter? 2. Do I need to control the PH? I installed a float valve which allows additional water to replace that lost to evaporation. 3. What about plants? Necessary? If so what types and how many ? 4. What about nutrients? Do the fish need anything more than just being fed twice a day? 5. 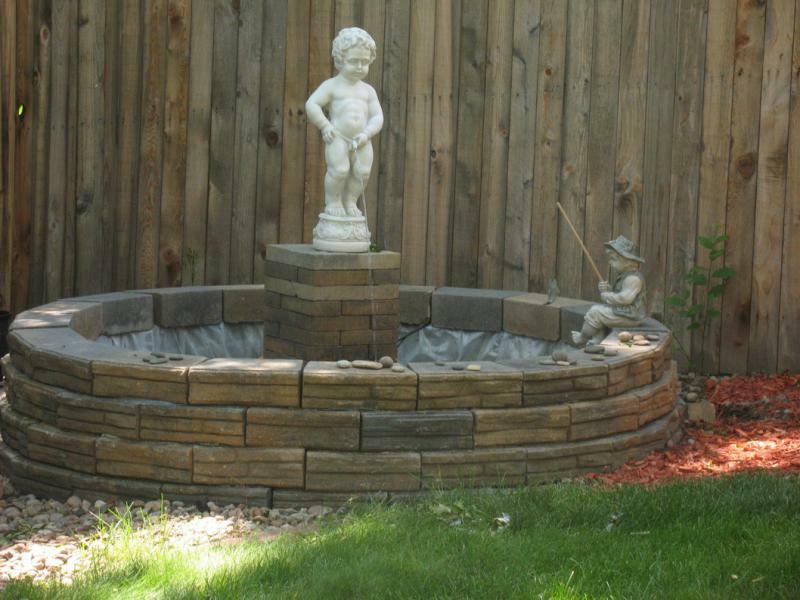 Will I need more than just the fountain to aerate the water? 6. What about water temp? I plan to add a thermostat controlled in-line water heater in the fall and cover the pool to keep it from freezing in the winter. Well first are you sticking with cold water fish such as goldfish? If it is tropicals or cold water the answers may be different. Filter, yes you need one. I'd use a good size canister made for a 220gal tank. I'd also use a sponge filter rated for a 120gal tank. I don't recommend the large pond sponges as they are a hassle to clean. I don't know if it is feasable, but a spongepre-filter on the water intake of the fountain would work wonders. P.H. it is doubtful you will encounter an issue unless the bioload gets way out of hand. As for the floating valve, are you accounting foe chlorine removal? The heater sounds like a good start, but if you want to keep fish out there year round the pool isn't deep enough. 3' is the standard depth for year round. Temp, here again it depends on cold water or tropicals. Most tropicals can handle the heat while goldfish struggle. The big thing is airation as warm water holds less oxygen. Plants, that is your call. A couple of clay flower pots with hornwart planted in it would look nice and the fish would love it. I'd stay clear of floating plants as they will likely take over. Where do you live?? That shallow of a pond can get pretty hot in the summer and and freeze through in the winter. The 3 feet mentioned is for temperature regulation for both seasons. Too, such a shallow pond makes it easy for wildlife to hunt your fish. I agree on the depth. Raccoons can stand up in 2.5 feet of water I think and eat from the buffet. Herons will find them too. 3' is needed for fish to winter over... that is below the frost line. But since yours is sitting above ground, not sure how that changes things... ie. will it freeze solid in the winter and if so, do you have an alternative for the winter time? Big tank? What are your winter plans? What state do you live in and how cold does it get in winter? I think the liner you use too has temperature parameters, meaning plastic cracks in cold temps... a rubber liner is better? If you are going to re-line this... now is the time to ask these questions and do this once. Read up a bit... there is the "pond" itself and how it functions (heater, water, filter, PH, algae, temperature, etc)... and the fish's needs. It's different because it isn't as "controlled" by you like an aquarium in the house. Oh... and looks really nice!! It might take a while for animals to know your pond is there but once they do it WILL be an issue. Good call on the liners - now is the time to make sure everything is how it needs to be.